Fort Sumner State Monument was established in 1968, one hundred years after the surviving interned Navajos were allowed to return to their homelands in northwestern New Mexico and northeastern Arizona. The Bosque Redondo Museum was officially opened on the property on June 4, 2005. 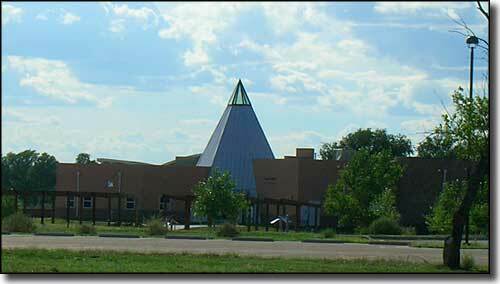 The museum was designed by Navajo architect David N. Sloan and offers exhibits detailing the stories of the Navajo people who were interned here. Kit Carson had been ordered to round up and move the Mescalero Apaches to the reservation at Bosque Redondo and succeeded in that quest by the end of 1862. Then he was ordered to round up and move the Navajos to Bosque Redondo. Rounding them up took until early 1864. Then the Navajos were forced to walk from Arizona to Fort Sumner. By April 1865, there were about 500 Mescaleros and about 8,500 Navajos living on the property. The Army had only enough provisions for 5,000 people. People were starving to death. The situation was aggravated by the lack of clean water and lack of firewood to cook with. By the end of 1865, most of the Mescaleros had been allowed to escape but the Navajos were kept in captivity until the Army finally admitted failure in May 1868. By that time, several thousand Navajos had died, many on the Long Walk, many more from the camp conditions. The Army abandoned the fort in 1869, then Lucien Maxwell (of the Maxwell Land Grant) bought the property. He remodeled one of the officers' quarters into a 20-room mansion and most of his extended family lived there. Maxwell died in 1876 and was buried in the Bosque Redondo cemetery near what is now the site of the Bosque Redondo Museum. In 1881, Sheriff Pat Garrett shot and killed Billy the Kid during the night of July 14, 1881 in Maxwell's house. Billy the Kid is now buried within yards of Maxwell. To get there: The route from downtown Fort Sumner is very well signed. The property is at the end of Billy the Kid Road. Admission: $5 per adult age 17 and up. Sunday admission is free to New Mexico residents with ID. Ages 16 and under are always free. 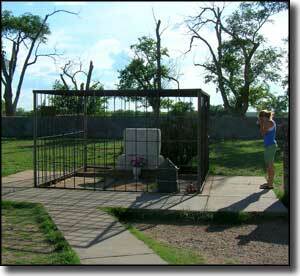 The Fort Sumner State Monument is open seven days a week from 8:30 am to 5 pm.